Need to schedule a bus? Bus Driver - Transportation Dept. Hi My name is LaDonna Berkey, I am the Transportation Director for our school district. Your child's safety Is our number one priority. The following list provides several ways in which you as parents or guardians can help us provide your child with a safe, enjoyable bus ride. Please read and go over with your children our districts school bus rules that can be found in your child's student handbook, and on the district's web page. 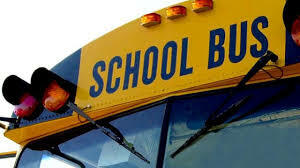 Children are to be standing at their assigned bus stop where they are visible by the approaching bus. They are to be ready to board five minutes before their scheduled pick up time. Children arriving late to a bus stop is dangerous. Children are never to run for a bus that is pulling away from the stop. When your child has missed the bus parents/guardians are not to follow behind a bus trying to chase the bus down to get their child on the bus at a location other than their assigned stop. This is dangerous. Please call the school Transportation Department and someone there will make contact with the bus driver to arrange a safe pick up location for your child if possible. If unable to make contact with the Transportation Department you will need to get your child to school. If your child waits for the bus in a vehicle, they are to be out of the vehicle standing, ready to board, before the bus arrives. This helps the loading process to be safe and efficient, it is also courteous to the drivers on the road. Another added benefit of students standing ready at their bus stop is that it helps substitute drivers locate the bus stop. Large instruments and items that are bulky, sharp or flammable are not to be transported on a school bus. If your student can’t hold the item in their lap while seated on a school bus, it will need to be transported to and from school by a parent/guardian. If different arrangements for your childs ride to and from school are needed, make sure a note is given to the child's school office staff so a bus pass can be made out and given to the bus driver. Notes must have parent name and contact phone number, address of where student is going, name and phone number of the people where your child is getting off the bus. Please no last minute changes by cell phone with your child. All passes to get off at alternate stops in the afternoon must be made ahead of time with the schools office staff and a bus pass written. We understand emergency situations come up after the buses have departed on route, when that happens, please call the transportation office, someone in the transportation department will make contact with the driver letting them know of the child's change in transportation. The afternoon driver will not release Primary students (K-2nd grd.) off the bus without seeing that a parent or older sibling is there to meet the bus. Parent/Guardian must give written directions for our records if different arrangements are to be made regarding who will meet the bus. Please have these arrangements made ahead of time to assist the bus route to run smoothly and safely each day.